Dr. Dipnarine Maharaj is the Medical Director of the South Florida Bone Marrow Stem Cell Transplant Institute and is regarded as one of the world’s foremost experts on adult stem cells. The Institute is comprised of its own clinical unit, a collection & processing facility, and the stem cell cryopreservation/storage lab. Dr. Maharaj was born in Trinidad and raised in Scotland. He received his medical degree in 1978 from the University of Glasgow Medical School, Scotland. He completed his internship and residency in Internal Medicine and Hematology at the University’s Royal Infirmary. He completed a three-year fellowship in Hematology, Oncology, and Bone Marrow Transplantation. Following his training, Dr. Maharaj worked with Alan Burnett, M.D., chairman of the United Kingdom Medical Research Council’s Acute Leukemia trials. Together, they helped develop the first Scottish Bone Marrow/Stem Cell Transplant Program and they were one of the first centers to publish their data on the use of autologous bone marrow transplantation for acute myeloid leukemia. Dr. Maharaj was recruited to the United States in 1990 to join the University of Miami’s (UM) bone marrow transplant team which was led by Dr. John Byrnes, who had trained with Dr. George Santos at Johns Hopkins Bone Marrow Transplant Center. Dr. Byrnes and Dr. Maharaj performed the first autologous bone marrow transplant at the University of Miami in 1991. Following a three-year tenure at UM, Dr. Maharaj began a totally outpatient Bone Marrow/Stem Cell Transplant Institute at Florida Medical Center in 1995. In 1997 he joined Bethesda Health Care System in Boynton Beach as medical director of the Bone Marrow/Stem Cell Transplant Institute at Bethesda, developing the outpatient program in Bethesda Health City. Since, 2001 Dr. Maharaj has run the Institute as an independent and has received accreditations from the Joint Commission and the American Association of Blood Banks (AABB). The Institute is also FDA registered. 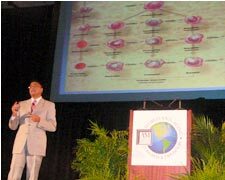 Dr. Maharaj has lectured at leading universities like Columbia University in New York, prestigious conferences such as the 2nd Annual Baltic Stem Cell Conference sponsored by the European Union and the Singularity Institute Summit, as well as local community group meetings such as the Rotary Club and the Kiwanis Club. Recently Dr. Maharaj’s work on cancer and Parkinson’s disease was featured by Suzanne Somers in her bestselling book “Bombshell: Explosive Secrets That Will Redefine Aging”. Currently, he is running an FDA approved Phase I / Phase II clinical trial for a new cancer therapy, and has developed a patented new protocol for the treatment of Parkinson’s disease. He focuses his work on treating patients who have chronic and immune diseases such as Parkinson’s disease, Alzheimer’s disease, strokes, and diabetes, as well as those who are interested in wellness. Enter your email address to follow Dr. Dipnarine Maharaj MD and receive notifications of new posts by email.